Revolutionary Therapy discovered and developed by Dr. Isaac Goiz Duran MD. Also known in Europe and other countries as Medical Biomagnetism is a scientifically sound alternative treatment that may help restore and maintain physical and mental health. On 1988 Dr. Isaac Goiz, Medical Surgeon, discovered the Biomagnetic Pair through which the vibrational therapy screens the body for all the pathogens that cause a dysfunction on the person and restores health by balancing the acidity and alkaline levels of the body by applying magnets of medium intensity to specific areas that are unbalanced. Because of this discovery the Oxford International University from England gave Dr. Isaac Goiz the Doctorate of Philosophy in Bio-energetic Medicine in 1999. Up to present and after 20 years of practicing Medical Biomagnetism, Dr. Goiz has identified more than 350 pairs that cover most of the glandular dysfunctions, diseases, syndromes and illnesses such as diabetes, cancer and HIV as well as emotional pairs. In general, common diseases are produced by a single Bio-Magnetic Pair (BMP). Dr. Goiz has very successfully treated more than 250,000 patients with Medical Biomagnetism and has trained more than 5,000 Medical Doctors and other Health Therapists from many different countries. Medical Biomagnetism is a new revolutionary, scientific and therapeutic approach to healing that differs from Traditional Medicine, Homeopathy, Herbs and Naturism. Medical Biomagnetism studies, detects, classifies, measures and corrects the fundamental alterations of the pH of living organisms. When the pH is balanced it immediately regulates and corrects the infectious pathologies. This new therapeutic criteria is able to identify the origin of viral and bacterial diseases, as well as glandular dysfunctions caused by pathogenic microorganisms in the organs. Dr Goiz discovered that viruses and fungus have a symbiotic relationship as well as bacterias do with parasites. Also bacterias and viruses resonate with each other which causes illness, being one of them pathogen and the other non pathogen depending of the specific illness. Bacterias and parasites live and grow in an alkaline enviroment while viruses and fungus live and grow in an acidic enviroment. It is possible to recover health through bio-magnetic fields of medium intensity, produced by natural magnets of 1,000 to 50,000 power of attraction (Gauss), applied in pairs in specific parts of the body called Bio-magnetic Pairs BMP. This neutralizes the pH of the area and pathogens inmediately die since they can not survive in a neutral pH enviroment. Cells become healthy and the body starts healing itself, surprisingly fast. Medical Biomagnetism consists on applying magnets with well-defined power of medium intensity to balance the pH in certain areas of the body. The therapy is also successfully used to find the origin of a person’s problem, it classifies new pathologies that can be treated, even if those new pathologies have not developed any symptoms yet. Furthermore, the therapy is used to prevent specific chronic, complex, degenerative diseases, syndromes and tumors that affect a person’s health. Current practices of traditional medicine target the symptom or degenerative signs that are caused by a single pathogen and do not target additional pathogens that are also part of an illness process. The admirable simplicity of this system allows working with powerful but inoffensive magnets of different forms from which amazing results are obtained. The dysfunctions in the organs that support the distortions of the pH are cured by a phenomenon called depolarization. This phenomenon is obtained by applying a magnetic field of the same polarity to each of the biomagnetic poles. This confronts the charges of the BMP and cancels, neutralizes the charges. Finally, the healing process occurs when the pH is balanced and reaches its optimal level that determines the well being of the person, which before the therapy was altered by the presence of pathogenic microorganisms that distorted the levels of acidity and alkalinity (pH) of the organs. This is what sustains the bio-energetic phenomenon. Is Biomagnetism similar to magnet therapy? No. Magnet therapy has been applied with one polar principle just for dysfunction or injuries under two concepts:a) South pole as analgesic, b) North pole as anti-inflammatory. The magnetic fields used for this purpose are of low intensity (between 100 to 500 gauss) and are applied for longer periods of time, hours or days, and in areas that show specific symptoms. The purpose of this explanation is to establish the difference between magnet therapy versus bio-magnetism and bio-energetic pairs. Bio-magnetism and bio-energetic pairs are a vibrational phenomenon related to medicine and both can be considered as medicinal therapy and medical science. The therapy consists on more than applying magnets with well-defined power of medium intensity,of 1,000 to 50,000 gauss to heal. Time of application varies from 10 -30 minutes depending on the country location in relation to the equator. 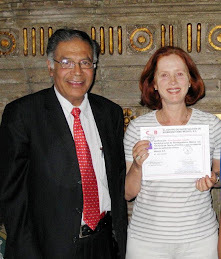 Helena Guerrero has been Certified as a Biomagnetism Therapist Levels 1 & 2 by The Center of Medical Biomagnetism Investigation, S.C., University of Chapingo, Mexico and by Dr. Isaac Goiz Duran. Biomagnetism Therapy consists on applying medium intensity magnets between 1000- 15 000 gauss in specific areas of the body in order to help balance the pH levels, of Alkalinity and Acidity in the body. I have to say that I am truly amazed at the results from your treatment. I was sceptical since I have seen so many healers and doctors. All of the chronic fatigue, muscle pain, migrains, breathing difficulty, as well as the other random infections I used to suffer from chronically have dissapeared. My menstual cycle has gone back to its normal cycle and I can even eat things that used to cause me headaches and indigestion. The energy I feel is so incredible! I feel like what any healthy person my age must feel like. It has been 8 years however that I have been living the lifestyle of an old woman in order to deal w the chronic fatigue/fibromialgia. I feel so free now! The energy just continues too, it does not drop off at the slightest change in my life which is what has happened to me w other therapies. Thank you so much. I will continue to send clients your way. Hello Helena: I want to thank you for treating Jane last Monday. We feel very fortune to have a friend with such healing potentials. The cronic pain from her back and shoulder is gone. The pain in her heel is also gone and the swelling has gone down totally, she can now wear regular shoes again plus she can stand for a long time which she could not before without being in pain. Just wanted to share this with you... Diana Kadah Tanaka. My back pain that I had for years went away right after the session. Amazing! Hi Helena, I feel much stronger and more solid in general.I have mentioned your Biomagnetism work to several people but they respond sceptically and don't seem interested in pursuing it. It's strange that so many people put their faith in Western Medicine when it's so ineffective. I guess my own health crisis caused me to explore alternative options because Western Medicine was not helpful. Hello Helena: I feel Good! Thanks for the treatment today. Your treatment helped me a lot! I'm really feeling much better. I'm looking forward to Tuesday's treatment too. See you tuesday. Love,Elizabeth Kuizenga. I've been many times to the doctor, taking different kind of antibiotics each one stronger than the last one and it did not help the problem, it would come back after I stopped taking the medication. I just couldn't go like that anymore. My friend told me about the improvement of her mom with Biomagnetism and I decided to give it a try. I'm glad I did. Thanks!